Booz Allen had evolved, and the company’s top leaders could see — the time was ripe to renew the essence of the brand, particularly its cultural foundation. Though Booz Allen had a set of 10 core values that historically had been well lived within the company, these values no longer possessed the same relevance that they had once held. Booz Allen needed to revisit this strong foundation and evolve it to hold greater relevance in the present workings of the organization. To help in this effort, Booz Allen engaged Baker. We stepped in to shape a program to reexamine what it means to “Be Booz Allen,” helping the company discover its higher purpose and redefine its core values. At the center of our work, we designed and facilitated highly participatory, collaborative work sessions that helped uncover the essence of the company’s purpose and values in a fun and indirect way. We led exercises that inspired participants to loosen up and explore the concepts in a non-academic way. Stepping away from being overly straightforward allowed genuine insights to emerge. In order to facilitate an engaging and interactive experience, each work session was capped at 16 people and 2-3 hours. In total, 140 participants were included. These individuals were thoughtfully selected and included the core project team, leadership team, partners, VP’s and highly engaged employees drawn from the company’s Rising Leaders and Ethics Advisor groups. A personal invitation from the CEO helped emphasize the importance of the sessions and encourage participation. These work sessions were highly successful, and participants walked away from them with a strong sense of inspiration. The findings of these sessions, along with secondary desk research, enabled us to define the company’s purpose and evolve the existing values, rephrasing them and packaging them in a way that was more dynamic and memorable. We presented these recommendations to the leadership team in a collaborative work session, giving them the opportunity put their imprint on the final product. Ultimately, Booz Allen’s purpose became “empower people to change the world.” The refreshed core values — unflinching courage, passionate service, champion’s heart, collective ingenuity and ferocious integrity — retained the essence of the prior values while capturing the spirit of the culture more succinctly. Collectively, this new purpose and renewed values differentiate the company and embody its treasured culture. 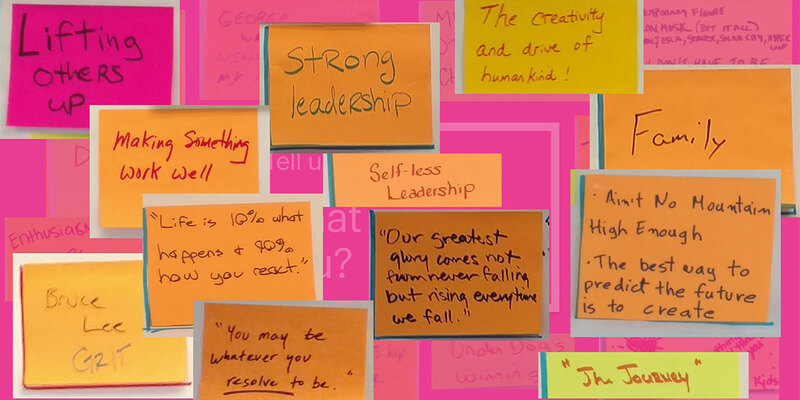 With great enthusiasm, Booz Allen launched its newly defined purpose and core values. The cascading approach began with an initial launch to about 150 partners and VP’s. This was followed up with a dramatic reveal to about 500 members of senior leadership at the company’s Annual Leadership Summit. The presentation at this live event featured vivid storytelling, as key leaders shared specific anecdotal illustrations of the core values in action. A filmed version of this live reveal was further disseminated throughout the company, allowing Booz Allen to reach its 22,000 employees scattered near and far, including many working onsite for clients. Now with renewed values in hand, each member of the organization is better equipped to bring the shared purpose and values to life each day. Most of your employees have similar desires — flexibility, growth opportunity, fair compensation and a purpose beyond profit. These are the needs of the 21st Century worker. Though millennials paved the way, yesterday’s status quo no longer attracts the best and brightest from any generation. In this Q&A with Gary Baker we discuss how a company can uncover its shared beliefs and most effectively bring them to life. Many companies find it challenging to develop an authentic employer brand. Those who do it right tend to possess these five noteworthy qualities that set them apart.